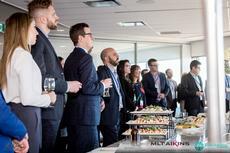 Spearheaded by CJA Campaign Chair, Steve Kroft and the Ben Gurion Society (BGS) Chairs, Leanne and Jared Akman, and Sarah and David Carr, the first ever Cocktails and Conversations event was launched. This event was created with the goal of inspiring the next generation of philanthropists to roll up their sleeves and get involved in Jewish as well as general community causes through volunteerism and leadership. Jamie Brown (CEO & Executive Producer, Frantic Films), Mark Chipman (Executive Chairman of the Board, True North Sports and Entertainment Ltd and the Winnipeg Jets Hockey Club), Rick Duha (CEO, Duha Group), Doug Harvey (CEO, DLH Group), Peter Jessiman (President, Western Capital Inc), Paul Mahon (President & CEO, Great West Life Co), Ash Modha (Chairman & CEO, Mondetta Clothing Co), Hartley Richardson (President & CEO, James Richardson & Sons, Limited), Sandy Riley (CEO, Richardson Financial Group), Bob Silver (President, Western Glove Works), Paul Soubry (President & CEO, New Flyer Industries, Kim Ulmer (Regional President of RBC for MB, SK, NW Ontario) and Larry Vickar (President, Vickar Automotive Group). The event has already demonstrated quite the impact on those who attended. Our hope is that this is the start of a stronger, more passionate Winnipeg community! "It was a wonderful event and I was humbled to be a part of it. The Winnipeg community gives back more than any other community and you can see it in the young people who want to make a difference. I’m always available in the future to help out.” – Ash Modha, Chairman and CEO, Mondetta Clothing Co.